In yet another gross display of Christian values, the Westboro Baptist Church decided to picket outside Beau Biden's funeral on Saturday in Wilmington, Delaware. 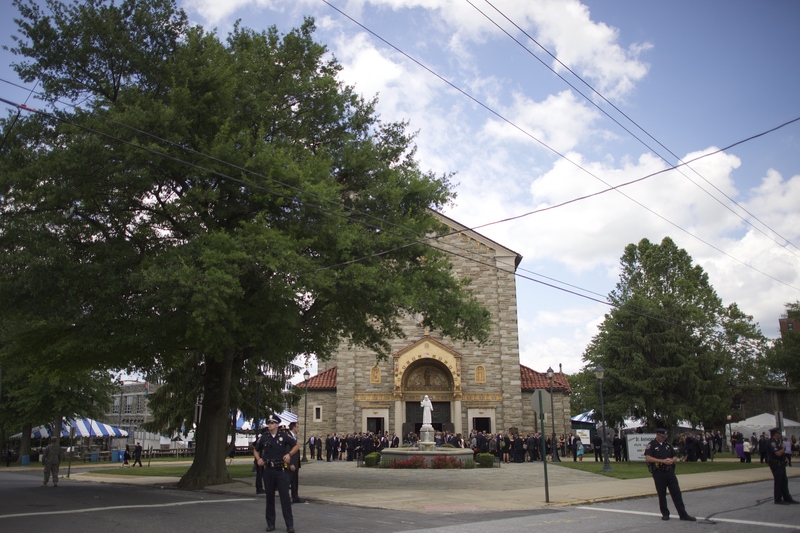 The group, fortunately, was mostly ignored by the mourners and Wilmington residents who gathered nearby St. Anthony of Padua Roman Catholic Church, but there was at least one minor incident. The Delaware News Journal reported a man threw hot coffee on the Westboro protesters as they were packing up their placards. The man who allegedly threw the coffee has been arrested, and so far is the only confirmed arrest stemming from Saturday's protest. It appears no one was injured by the coffee attack. There were only several Westboro protesters in Wilmington picketing ahead of Beau Biden's funeral. The group, which is largely known as a militant religious organization with an extreme anti-LGBT agenda, announced its intention the day before, claiming the former Delaware attorney general's life was "cut short by the will of God to whom all glory is given and he has an eternity of answering to the Lord for his own words, thoughts, actions and sins." Delaware News Journal reporter Esteban Parra captured the coffee-throwing incident and ensuing arrest, posting two photos to his Instagram account. One photo shows the unidentified man holding what appears to be a cup of coffee as the protesters hurry to place their signs in the back of a car. Another photo shows the unidentified being arrested by a law enforcement officer. But for some good news, the Westboro protesters were drowned out by a counter protest, which reportedly reached 100 people at one point. The counter protesters stood across the street, holding loving signs and American flags, and sang "Amazing Grace" to overpower the hate group, Parra reported. This is hardly the first time the Westboro Baptist Church has picketed a funeral — actually, it's kind of like their, well, thing. In the past, the group has picketed the funerals of Michael Jackson, Sandy Hook massacre victims, and service members who were killed during the Iraq war. In 2011, the group triggered the state of Arizona to pass a law banning protests within 300 feet of a funeral after the Westboro Baptist Church announced it would hold demonstrations at the funerals for those killed during a Rep. Gabrielle Giffords meet-and-greet in Tucson, Arizona. Thankfully, there are always more people countering the extremist group's tasteless protests than are followers of the Westboro Baptist Church.